At Frankenstein, the Amphitheater looked better than it has all through the early season with high water volume routes (Pegasus, Chia) finally receiving the cold temperatures they need to begin to freeze. Still not in its full glory, but on its way. The ice left of Smear, above the well protected M5 corner of Scream, looks pretty cool. There is a great WI 3+ ish slab over there called Banshee which receives little traffic. It’s looking good now. Beware of the top-outs. 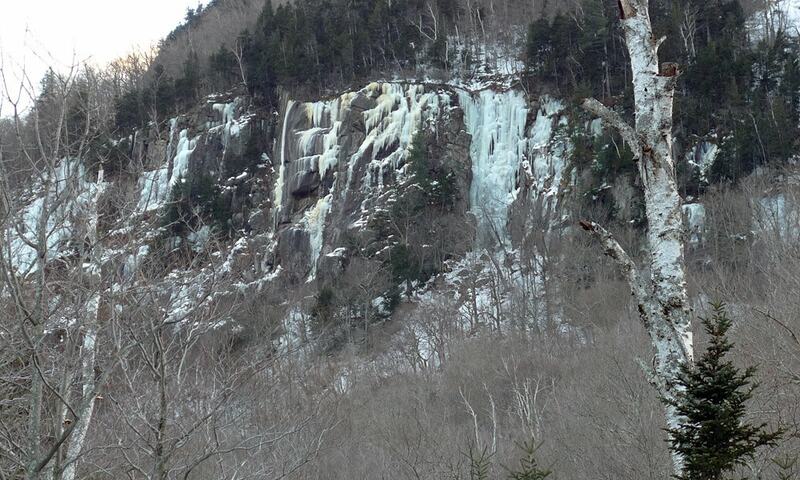 After a rain the mini-brooks that feed the amphitheater are running hard leaving the tops of these ice climbs often floating over running water. If you want to push your leading grade in the amphitheater area, I would recommend waiting until things have time to freeze further. From far left (behind the trees) is the top of Standard then Penguin and break in the cliff, then Dropline, Welcome to the Machine, Coffin and Dracula. Hopefully the water continues to flow and they just get fatter! This is the shadiest of the major areas at Frankenstein and does the best in the early season. If it took a hit in the rains last week it’s hard to tell now. Looks like good early season conditions and very similar to a couple of weeks ago. 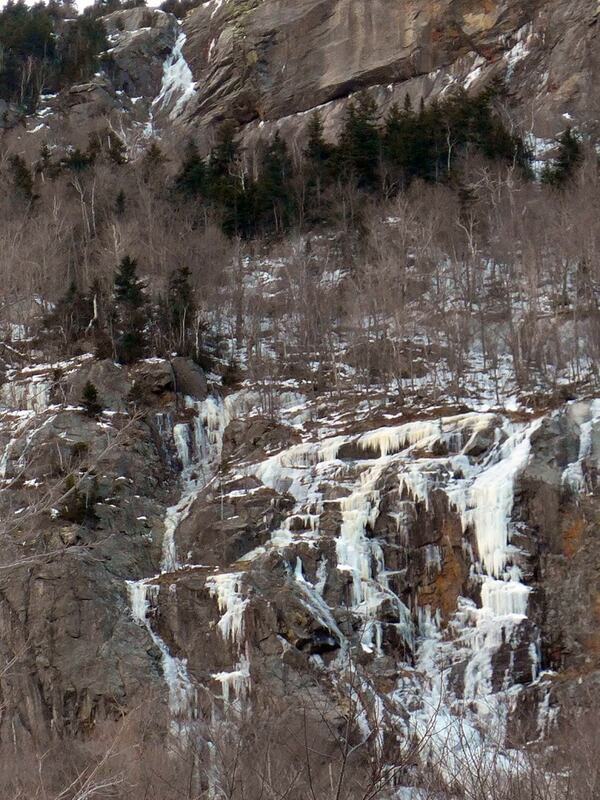 Mt Willard has been the champ this season with the best conditions in the Notch. Sam Bendroth and I took a run up Hitchcock Gully yesterday afternoon and found amenable conditions despite the dry debris pile on the railroad tracks at the base of the gully. The rains flushed all the leaves, etc out of Lower Hitchcock and despite some patches without snow, the whole of this section is mostly climbed on nice hard snow or fresh sticky ice. Some weekend snow will make it look more alpine, but the conditions make for a fairly low exertion outing with good cramponing. Upper Hitchcock looked fine and all the flows along that Upper Eastern Tier look really good. Number Gullies and Cauliflower above, Mt Webster. 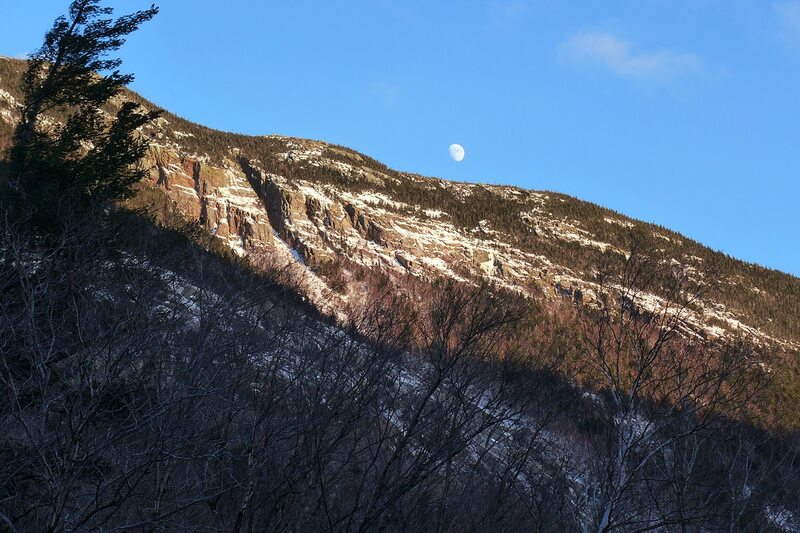 The moon rising over the mini-Canadian Rockies cliff band of Mt Webster. 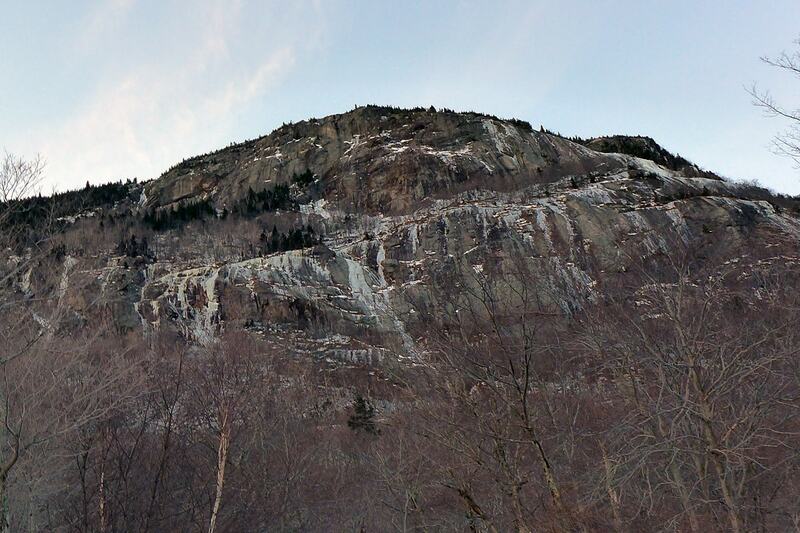 Not much snow on the South Face of Mt. Willard, but the ice is coming in. 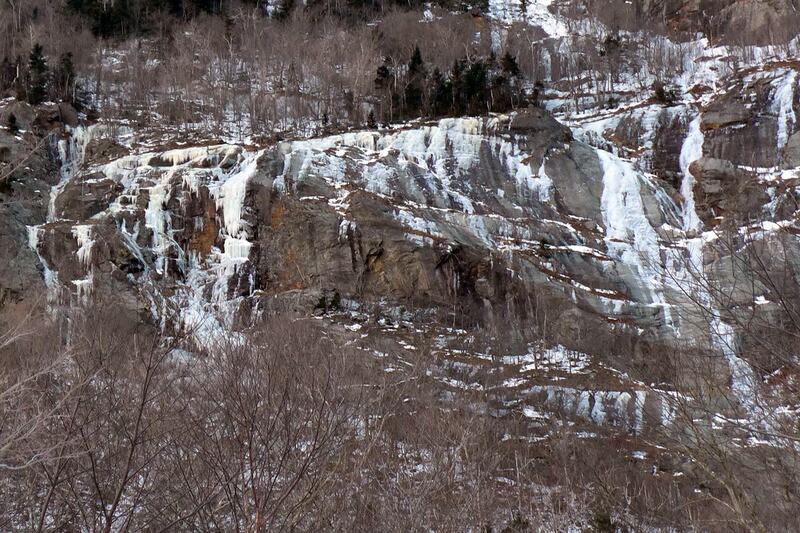 There is ice top to bottom on Cinema Gully, but it stills looks thin. 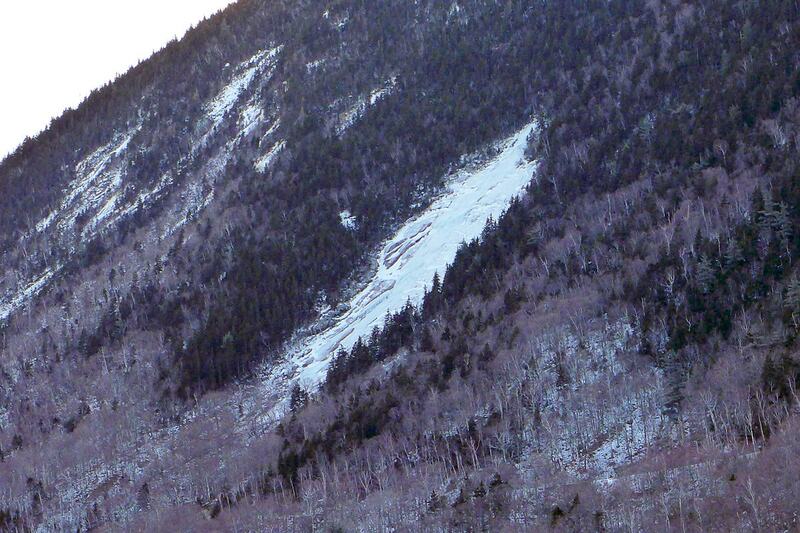 Close up view of the lower cliff band on Mt Willard’s South Face. number Gullies on the left, Cinema on the right. Willey’s MF Slide. Looking very icey.